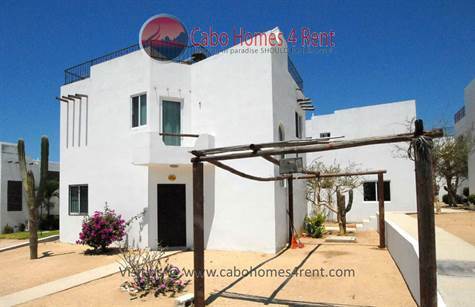 La Cima, El Tezal - Located in the tranquil, gated community of La Cima, this furnished 2 bedroom, 2 bathroom, charming home is centrally located to everything Cabo San Lucas has to offer! Find yourself: 3 mins to WalMart shopping plaza, 4 mins to Cabo San Lucas, 6 mins to Costco, 8 mins to Home Depot, 20 mins to San Jose del Cabo & 28 mins to the SJD International Airport. There are also many swimmable beaches & a number of world class golf courses within 15 mins! This quaint home is comfortably furnished and fully appointed, just bring your suitcases! The additional rooftop access/terrace offers 360 degree views of the Sea of Cortez, Land's End, beautiful desert landscapes, rolling hills, and vibrant city lights! Other notable features include: 24hr security, common pool & BBQ area, and full time property manager. Available immediately on a 12 month contract. Damage deposit due upon signing, 1st & last months rent due upon occupancy. Rent includes HOA. Tenant to pay for all other utilities. Sorry no pets.